The Palestinian Authority continued to refer patients to AVH in 2016 for cancer treatments and other treatments not available in Gaza or the West Bank. The hospital had serious cash-flow problems in 2016 as well as prior years due to delayed payments by the Palestinian Authority to cover the costs for the cancer patients it refers to the hospital. LWF, the hospital, and the hospital’s board, together with LWF member churches and related agencies, continued their advocacy work in 2016 addressing the cash-flow crisis. The LWF Jerusalem Program is pleased to report that in early 2017 the United States released $25 million for Palestinian Authority debts to East Jerusalem hospitals, of which Augusta Victoria Hospital received more than $11 million, reducing by approximately 30 percent the amount of money owed to AVH by the Palestinian Authority for the treatment of Gaza and West Bank patients referred to AVH. Many thanks to everyone who advocated in 2016 on behalf of the funding for Augusta Victoria Hospital and the East Jerusalem hospitals! Your efforts are much appreciated. The bipartisan support for the release of the U.S. funds was important and will be helpful in 2017 when the problem will most likely come up again. Despite the U.S. payment and another from the European Union, the debt of the Palestinian Authority for health care in East Jerusalem remains unacceptably high. Therefore, the LWF will continue to encourage advocacy by friends and partners. 1) Encourage your members of Congress to support funding in 2017 that will sustain Augusta Victoria Hospital and the other East Jerusalem hospitals in light of the Palestinian Authority’s lack of payments. 2) As President Trump has invited Palestinian President Mahmoud Abbas to a meeting at the White House on May 3, ask your members of Congress to raise the issue of the funding for the East Jerusalem hospitals with President Trump and ask that this issue be on the agenda of the Trump-Abbas meeting. Additional U.S. funding for the East Jerusalem hospitals is relevant to the Abbas visit because budgetary and humanitarian assistance for the Palestinian Authority will surely be a topic. Ask President Trump to make a U.S. pledge for substantial 2017 funding for Augusta Victoria Hospital and the East Jerusalem hospitals and ask that President Trump encourage President Abbas to ensure immediate payment and regular payments by the Palestinian Authority to the East Jerusalem hospitals. 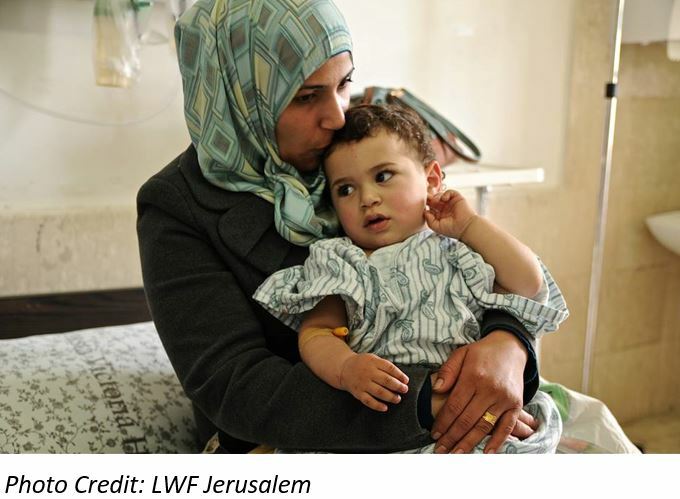 3) Ask your members of Congress to visit Augusta Victoria Hospital if they are coming to Jerusalem in 2017 to see for themselves the development of the hospital as a cancer center and what that means in the lives of so many West Bank and Gaza Palestinians. Contact the Rev. Mark Brown, LWF Jerusalem Program representative, at Mark@lwfjerusalem.org and +972-53-525-5843. Reach your lawmakers at the ELCA Action Center! Contact the Peace Not Walls team for additional information: peacenotwalls@elca.org.